This mask will blow you away! It does so many things at once that it is like a multi-mask in a jar. It will help brighten + exfoliate + even tone + detox pores. This will dry all the way, but you can mix it with honey or even agave to make it more hydrating. Most Vitamin C Masks come to you already hydrated, shortening the shelf life to about two weeks from the date it was mixed. This means you are paying for Vitamin C, but only getting it in the first few applications. Not here! This comes dry and you mix it fresh each time you use it! If you have super sensitive skin, mix this half and half with just plain clay or with a cream cleanser. L-Ascorbic Acid can sting very sensitive skin. I do have other options that do not. This is one of my favorites for all skin types + I love using this twice a week or when my skin is just blah. Vitamin C in its most potent form is fresh every time you mix it. White Kaolin Clay acts as a gentle detoxifier and gently removes excess oil and toxins from the skin. Moroccan Red Clay is added for its ability to leave skin glowing and refreshed, and it gives this mask the peach color. Organic Gunpowder Green helps to tone and smooth skin as it fights free radical damage. Organic Licorice Root is known to help even skin tone. 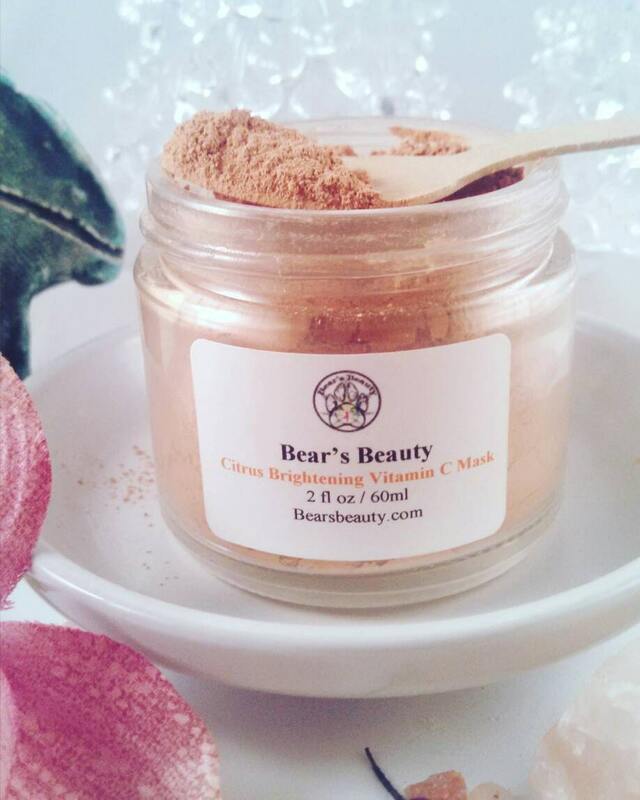 Organic Orange + Lime + Lemon + Grapefruit Peel Powders gently exfoliate and brighten. L - Ascorbic Acid (Vitamin C) helps to gently brighten and exfoliate tired skin + encourages collagen production + reduces signs of aging. Zinc Oxide (Non Nano) absorbs oil and helps to reduce redness and inflammation. Essential Oils of Sweet Orange + Lemon + Grapefruit are uplifting as well as help even tone + reduce spots + and brighten complexion. Mix 1 tsp of mask with your choice of water, aloe vera, or juice a few drops at a time to form a thin paste. You can also do this in a small glass bowl. Apply a thin layer to cleansed skin, allow to sit for 10-20 minutes, remove with warm water. Follow with Toner + Serum + Moisturizer of choice.